Homemade beef burgers - Gluten & grain-free. Paleo & SCD. This homemade beef burgers recipe is one of my go-to midweek meals. 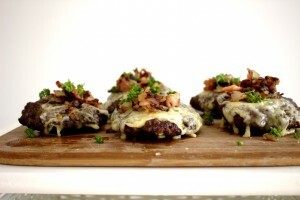 The burgers are so easy to throw together and I always have the ingredients to hand. If I’m super-organised, I’ll make them in to patties the night before and keep them in the fridge overnight. That way the next day I just have to grill them and dinner’s ready. They definitely benefit from some firming-up time in the fridge but if you are in a rush then you can still make them without. I’ve been making my own burgers for as long as I can remember. Even before I was married and still living at home, I used to make Jamie Oliver’s recipe. His version uses crackers though so I had to scrap that one as soon as I started the Specific Carbohydrate Diet (SCD). I’m happy to say that these homemade beef burgers taste even better. I have tweaked this recipe quite a few times and I think the recipe is well-balanced and delicious now. Homemade beef burgers are a firm family favourite and I love only having to cook one dinner for all of us. We usually pair them with some seasonal vegetables or a delicious salad. Although this is a all-year round recipe, we love cooking these in the summer on the barbecue for a lazy evening at home. I added cheddar cheese, bacon and shallots to them because well, it takes them to the next level. I hope you agree! 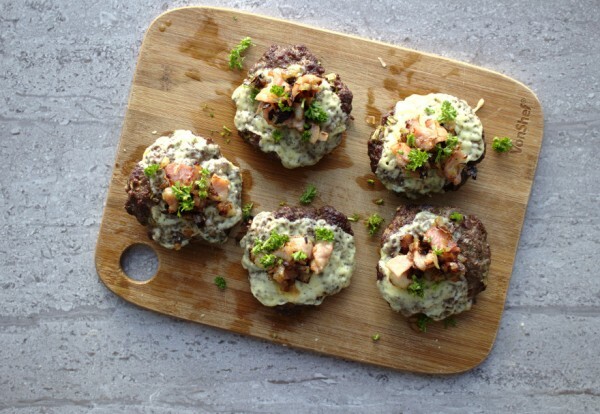 A great prepare ahead tip for these burgers is to double up and make an extra batch for the freezer. As long as the beef mince wasn’t previously frozen, I would freeze them uncooked in patty-form. To cook then, simply defrost in the fridge overnight and follow the instructions below. 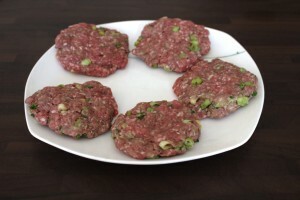 Delicious homemade beef burgers made with fresh herbs and ingredients in your fridge. Gluten and grain-free. Paleo and Specific Carbohydrate Diet-friendly. 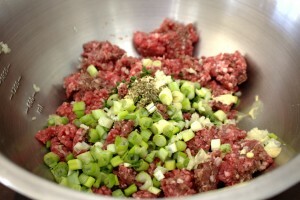 Mix all the ingredients for the burgers into a bowl. Mix well. Make the mixture into five burgers. Place on a plate and refrigerate for at least 30 minutes. Preheat the grill to 220°C, 428°F. Grill the burgers for 20-30 minutes until cooked through. You should turn them half way through the cooking. I also recommend checking them with a meat thermometer. While the burgers are grilling, heat the olive oil in a small frying pan on a low-medium heat. Add the bacon and shallots and cook until the bacon is fully cooked and brown but not burnt. Turn off the heat. Five minutes before the burgers are cooked, add the cheese slices so that they melt under the grill. 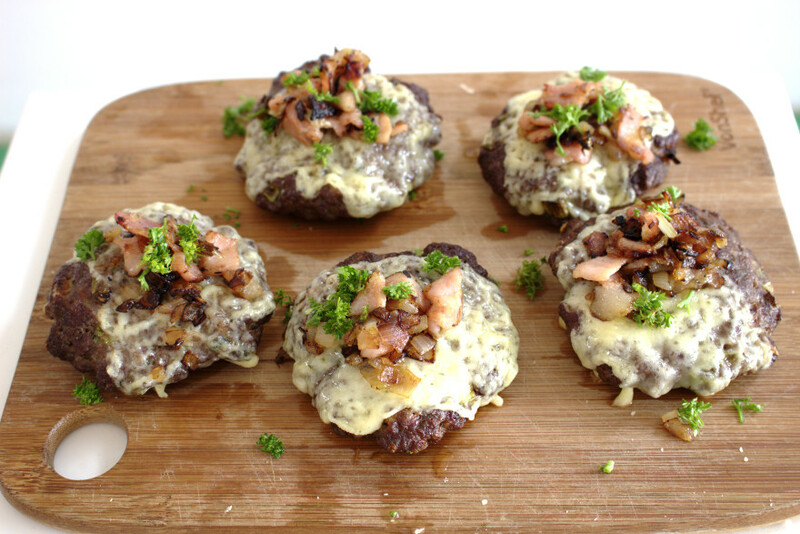 Once cooked, remove the burgers and serve with some bacon and shallots. Add some extra fresh parsley if desired.